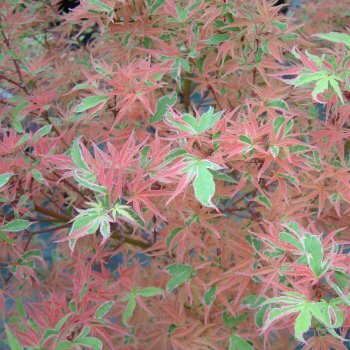 Acer 'Beni-Schichihenge' is one of the best variegated forms of Japanese Maples. Translated to "red and changeful," Beni-Schichihenge lives up to its name with the variety of colours produced throughout the seasons. Spectacularly white, margined bluish/green leaves are overlaid with pink and orange hues in the spring and summer before glowing with orange and gold tones in the autumn. This is a medium sized, deciduous shrub, ideal for any small garden or for planting into a border in a larger garden. Beni Schichihenge will grow to an estimated 2 x 1 metres in 20 years and requires well drained soil. Like all Acer palmatum varieties, Beni Schichihinge needs protection from cold winds. Pot grown Beni Schichihenge Japanese Maples can be planted at any time of the year. Firstly, remove all weeds and grass within a metre of your desired planting hole then dig a square hole as deep as your root mass and approximately 2x as wide. To help your tree establish more effectively, we advise sprinkling root grow in the hole, especially if you have poor soil.